The fight is real: People want to know they and their loved ones will be safe–that no harm will be done, that they will experience the expected outcome–when undergoing surgery, medical procedures, or medication administration. 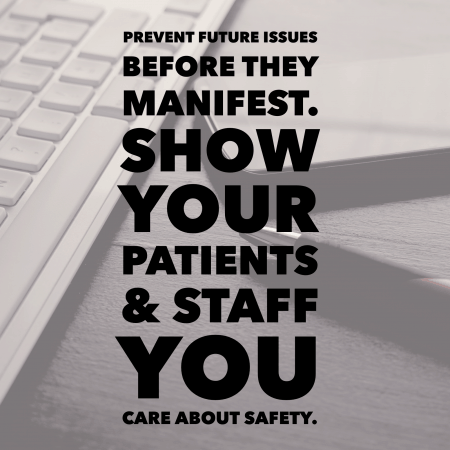 Advocates for patient safety are often those who’ve experienced firsthand losing someone close to them due to a medical mistake by human error. Dr. Martin Makary, of the Johns Hopkins University School of Medicine, defines a death due to medical error as “one that is caused by inadequately skilled staff, error in judgment or care, a system defect or a preventable adverse effect. This includes computer breakdowns, mix-ups with the doses or types of medications administered to patients, and surgical complications that go undiagnosed” (CNBC, “The third-leading cause of death most doctors don’t want you to know about,” Feb. 2018). What can patient safety professionals do to make significant improvements in patient safety and the quality of care? To start with, healthcare professionals can adopt best practices from other industries that have been proven to improve human performance. This includes advanced root cause analysis through TapRooT®. A comprehensive study by researchers at John Hopkins University has found that medical mistakes are now responsible for more deaths in the U.S. each year than accidents, respiratory disease, and strokes. The study estimates that more than a quarter million people die annually due to errors made during medical procedures. The statistic does not include other sentinel events that do not result in death. Among the errors are wrong site surgeries, misadministration of drugs, improper use of medical devices, and seemingly ordinary events such as slips and falls. 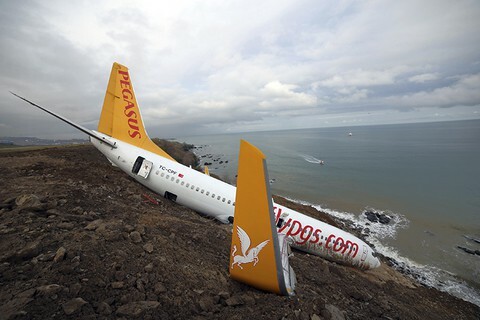 TapRooT®’s focus is on helping the medical community learn from its mistakes and prevent repeat incidents. 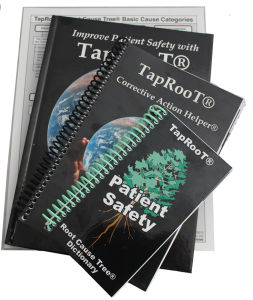 The new publications equip medical professionals with knowledge of advanced root cause analysis through the TapRooT® System. The TapRooT® System provides a scientific method to find and fix the causes of human error and equipment failures. TapRooT® Root Cause Analysis can be used to reactively investigate and prevent repeat sentinel events or proactively to improve performance by finding and fixing a problem’s root cause before a medical mistake occurs. 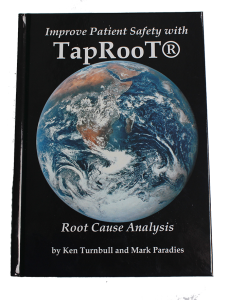 Mark Paradies and Ken Turnbull are the authors of “Improve Patient Safety with TapRooT® Root Cause Analysis.” Paradies has 38 years of experience in high reliability organizations, process safety, incident investigation, and root cause analysis. His career began as a leader in Admiral Rickover’s Nuclear Navy, where he earned Engineer qualification. He worked for Dupont in the areas of human factors, process safety, and performance improvement management prior to starting System Improvements Inc. 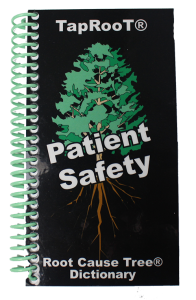 In 1993, after his mother suffered from a sentinel event, Paradies launched System Improvements’ initiative to improve patient safety. Turnbull began his career in fire safety engineering, industrial safety, and process safety in the chemical and oil industry. After retiring as Corporate Safety Manager for Texaco, where he had used the TapRooT® System, Turnbull became a TapRooT® Instructor. Since then, he has helped people around the world improve their root cause analysis and stop repeat problems, including training over 500 healthcare professionals to use TapRooT® to stop patient safety events. Turnbull’s wife is a retired nurse practitioner and his sister is an emergency medical physician—relationships which helped drive his interest in patient safety. The pocket-sized medical dictionary, “TapRooT® Root Cause Tree® Patient Safety Dictionary.” authored by Mark Paradies and Linda Unger, is for use in tandem with TapRooT®’s Root Cause Tree® (the Root Cause Tree® is part of the TapRooT® System for root cause analysis and problem investigation), providing definitions for each category on the tree. The definitions are in the form of questions and any “yes” answers apply to the causal factor or issue being analyzed. The dictionary is also a useful resource in helping settle debates between team members when using the Root Cause Tree®. For details or inquiries about the TapRooT® System, call System Improvements Inc. at 865-539-2139, or contact us online at www.taproot.com/contact/. Learn more about TapRooT® at www.taproot.com. You may purchase the books through the TapRooT® store. 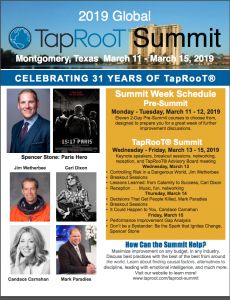 Sign up for the one conference you should attend this year: The 2019 Global TapRooT® Summit, March 11-15, 2019, in Montgomery, Texas, at La Torretta Lake Resort. Get the benefit of learning through advanced Pre-Summit courses, conveniently offered March 11-12. Be part of the Summit’s important conversations, network with safety professionals and instructors from around the globe, implement the practices and training you pick up at the Summit when you get back to your workplace, and hear keynote speakers who’ve made a difference in their professions.